If you always wanted an authentic USA made atomizer but couldn’t afford it due to their big prices, you’re going to love this review because today we’ll be taking a closer look at the REMentry RDA, one of the cheapest rebuildable dripping atomizers that’s manufactured in the United States. And when we say cheap, we mean something in the $30 price range but without any strings attached. 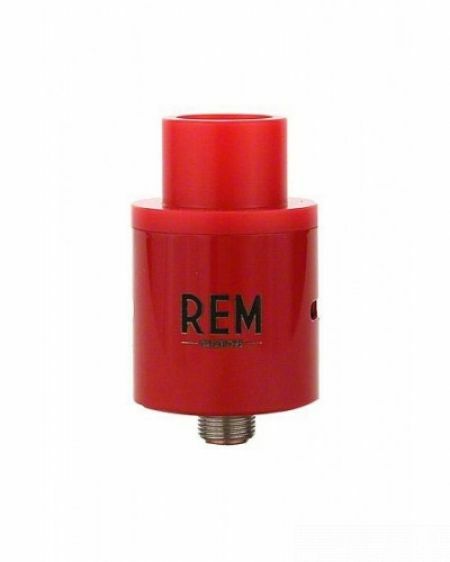 Manufactured by REM Creations, a small vape gear company from Orange Country, California the REMentry RDA is probably one of the hottest looking atomizers we’ve seen in the past months and the paint job on them is fantastic. They come in a variety of colors Baby Blue, Green, Blue, Red, Stainless, Black, Pink, and White and the Delrin cap matches the body so it’s the kind of RDA that will get you noticed. The device comes packed in hard, transparent plastic rectangular box and the color of the packaging matches the color of the atty so that’s also a great plus in terms of first impressions. It’s much bigger than the RDA, and it even has a see-through window to check out the product without unboxing it. Inside you will find the fully assembled REMentry, as well as a bag of goodies which includes the famous small blue screwdriver, two spare O-rings, and two spare post screws. The design of the REMentry RDA is simple yet very appealing and the glossy paint gives you that premium feel (much like the one on the eVic VT). 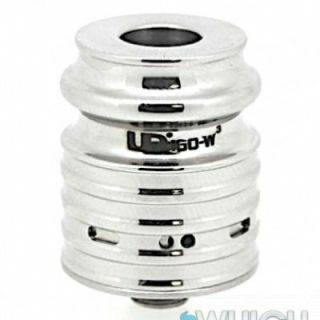 It has a diameter of 22mm and it comes with a Delrin wide bore drip tip that measures around 11mm in diameter. 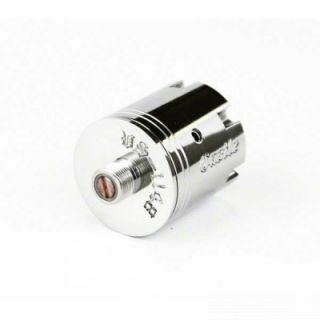 It’s made out of three distinct pieces – the top cap, barrel and base and it has a protruding 510 connector with a copper center pin. 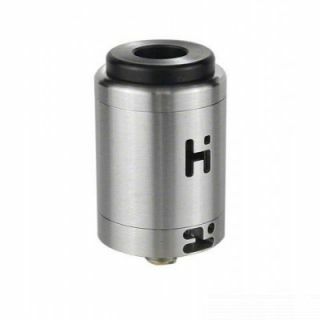 The connector protrudes enough to use this atty on hybrid mods so that’s another big plus. The base has a Delrin insulator surrounding the 510 connector, and that’s going to help stop the heat transfer between the mod and the RDA. The deck has three rectangular posts (two negative and a positive one) as well as a very generous juice well. The two negative posts have been machined straight on the base, while the positive post is surrounded by a rectangular PEEK insulator. These posts come with chunky Philips head screws and the holes for the wires are more than generous. 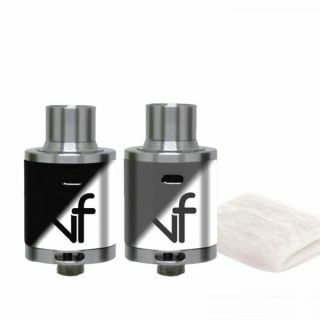 The barrel comes with two holes for the airflow mechanism and the RDA can be used in single as well as in dual coil mode (also quad coil). It is made from stainless steel and it creates a seal with the deck via an O-ring at the base. The company logo has been carefully engraved on the beautiful finish and it looks like a charm. 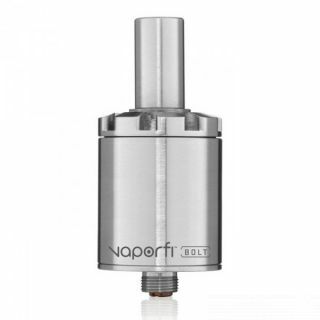 The top cap includes the drip tip (chuff cap) and it’s made from a single piece of Delrin. It also incorporates the adjustable airflow mechanism and it’s sealed to the barrel via two O-rings. Adjusting the air is pretty simple and you simply need to twist the top cap according to your personal preference. Mounting coils and using the REMentry RDA has been an absolute pleasure and we have to say this is one of the simplest and most efficient atties we’ve tested in months. The vapor production is outstanding and the flavor is very similar to a Kennedy or a Hobo. Also the Delrin top cap does an excellent job at preventing the heat from those coils and the end experience is top notch.